A new paper-based sensor patch developed by researchers at Binghamton University, State University of New York could allow diabetics to effectively measure glucose levels during exercise. Today’s most widespread methods for glucose self-testing involve monitoring glucose levels in blood. Conventional measurements, however, are not suitable for preventing hypoglycemia during exercise, said Binghamton University Electrical and Computer Science Assistant Professor Seokheun Choi. “This is because 1) the underlying process relies on invasive and inconvenient blood sampling, causing the possibility of sample contamination and skin irritation with sweat containing various electrolytes and proteins; 2) the method needs patients to carry many accessories during physical activity, including lancets, alcohol swabs and a relatively large glucometer; and 3) the technique requires a sophisticated electrochemical sensing technique and sufficient electrical energy, which makes the technique difficult to be fully integrated in a compact and portable fashion,” Choi said. 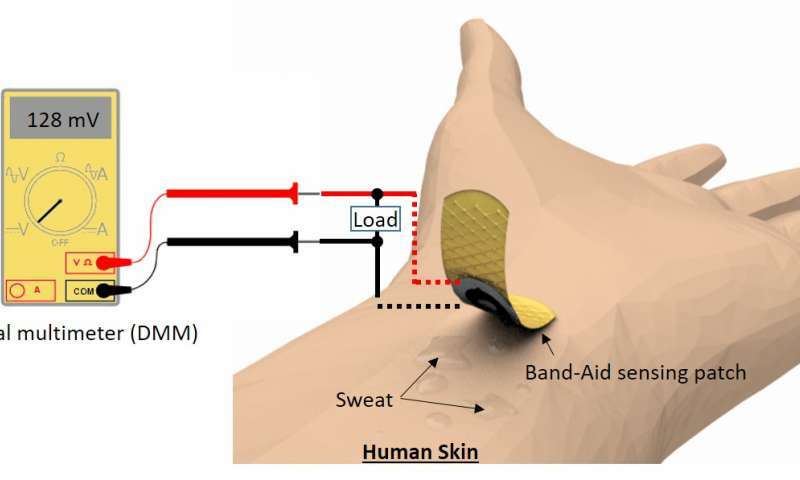 Choi and fellow researchers have developed and demonstrated a self-powered, wearable and disposable patch that allows for non-invasive monitoring of glucose in human sweat. This wearable, single-use biosensor integrates a vertically stacked, paper-based glucose/oxygen enzymatic fuel cell into a standard Band-Aid adhesive patch. “The paper-based device attaches directly to skin, wicks sweat to a reservoir where chemical energy is converted to electrical energy, and monitors glucose without external power and sophisticated readout instruments,” said Choi. Sweat-based glucose sensing is attractive for managing exercise-induced hypoglycemia because the measurement is performed during or immediately after exercise when there is enough sweat to obtain an adequate sample, said Choi. This potential alleviates shortcomings of conventional non-invasive sweat sensors, which can be hampered by the difficulty of collecting enough sweat for analysis, sample evaporation and the relatively long time required for sample collection. “The sensing platform holds considerable promise for efficient diabetes management, and a fully integrated system with a simple readout can be realized toward continuous non-invasive glucose monitoring,” wrote the researchers.